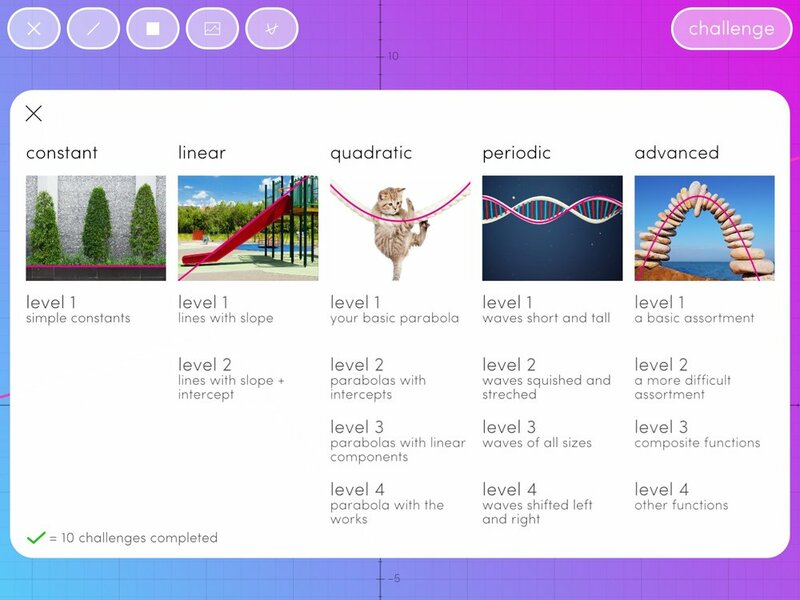 Y = World is a breakthrough educational app that invites students to discover the visual world of math. The truth is that every student understands concepts like slope, acceleration and frequency long before they enter high school. They understand these things intuitively because they understand them visually. What students don’t understand is how these concepts connect to the symbolic and syntactic expressions of mathematics. 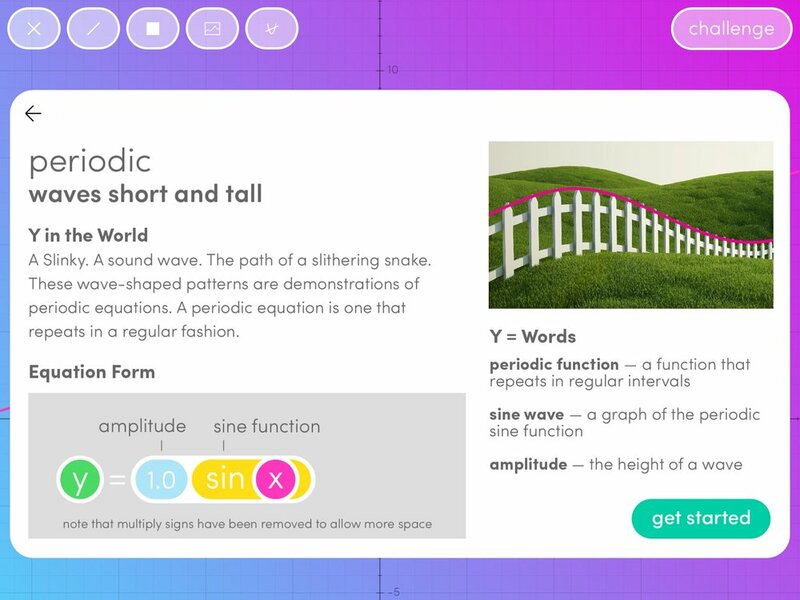 This is what Y = World is all about — connecting intuitive visual thinking to the symbols that make up an equation. In Y = World, students learn in two ways. First, they learn by constructing equations, piece by piece. As they do so, and with each successive element, they see the graph changing based on their actions. Second, they learn by playing with the numbers in their equations. 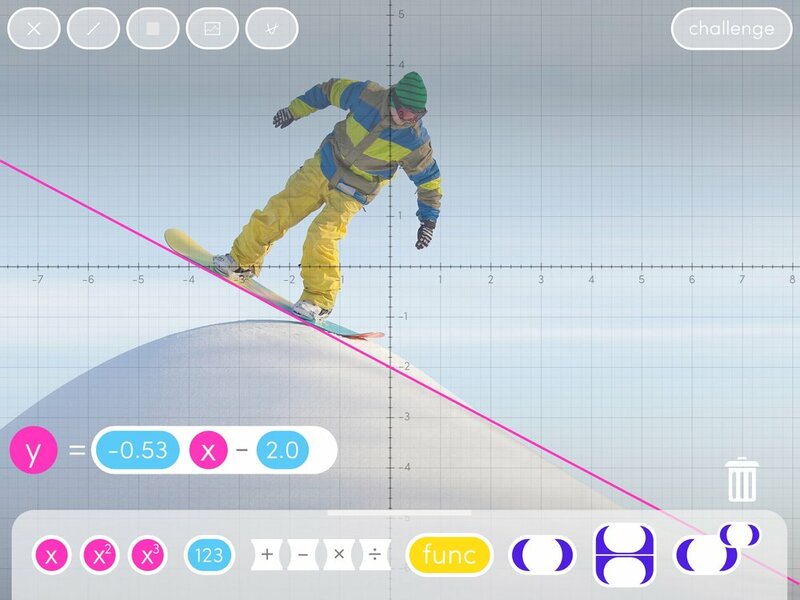 By sliding the Constant Slider for slope left and right and seeing the graph change in real-time, students immediately make the connection between the number they are playing with, and the effect it is having on the line being graphed. The same process applies just as easily to other concepts like acceleration and frequency. This positive feedback loop leads students down the path of understanding, connecting what they already know intuitively and can observe visually to what they are learning symbolically. 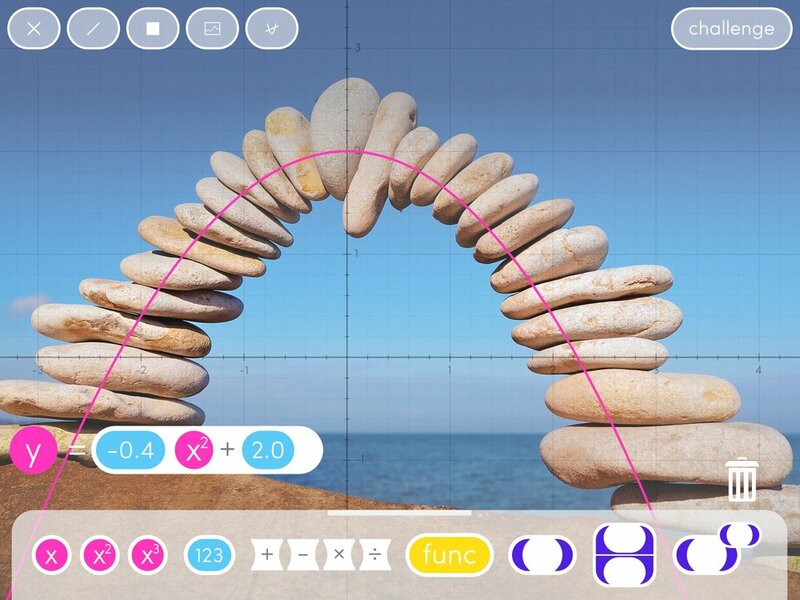 True to its name, Y = World encourages students to consider the math they are seeing in context of the real world. They do this by constructing equations that model the shapes found in photos of actual places and things. The app comes with a library of 256 photos. Alternatively, students can use the iPad’s camera to take their own photos of the world around them. Y = World also features a Challenge Mode. In this mode, students are shown a graph and are asked to match it by constructing an equation. Challenge Mode graphs are time-synced so a whole classroom of students can work on the same problems and race to finish them. Y = World is a great addition to any mathematics curriculum. It’s fun, it’s simple and it’s designed for classroom use. Students get to know functions by the shapes they make. 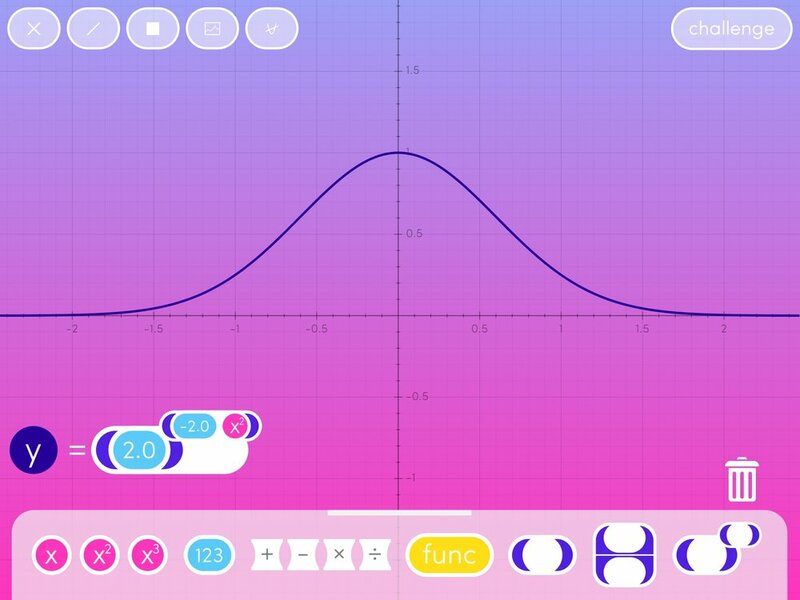 By playing with the app's Constant Sliders, students quickly grasp how functions flex and change. Y = World also supports the creation of multiple equations at the same time. Y = World encourages students to think about the world in terms of mathematical forms. The apps comes with a library of 256 photos like the ones above. Students can also take their own photos with the iPad camera. 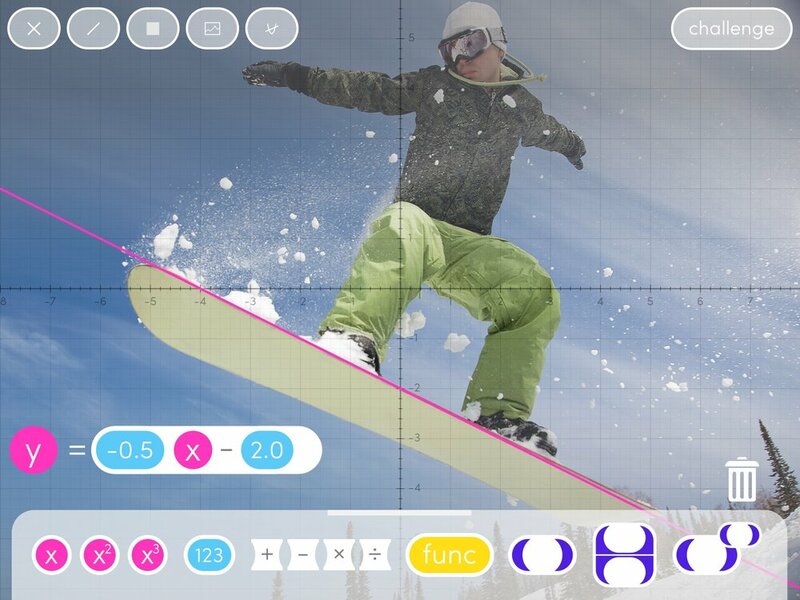 Y = World has a richly developed Challenge Mode where students are asked to match a given graph by crafting an equation from scratch. Challenges are randomly generated based on the actual time, so an entire class can work through the same challenges, all on separate devices.